Ai Fujiwara, visiting from Tokyo, looks over items for sale at a booth at the swap meet at Aloha Stadium. 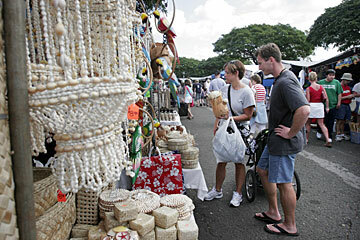 The swap meet is an alternative to more expensive tourist shopping in Waikiki. JAPANESE VISITORS Tammy Shinohara and her friend Reiko Imachi picked up a ukulele at a swap meet stand on Wednesday, studied its workmanship and price, then put it down. They circled Brian Chua's Finale shop for more wares, but came back to the ukulele several times before the shopkeeper made contact and attempted to close a deal. Chua picked up the ukulele and played a note or two, but the real rhythm began when the bargaining started. In the end, the award for best song and dance went to Shinohara and Imachi, who decided to circle the swap meet in search of better bargains despite Chua's decision to meet their price. While Japan visitors are still big spenders when it comes to Waikiki hotels and designer shops, Chua said that at the swap meet they're his smallest tourist group and his toughest sell. 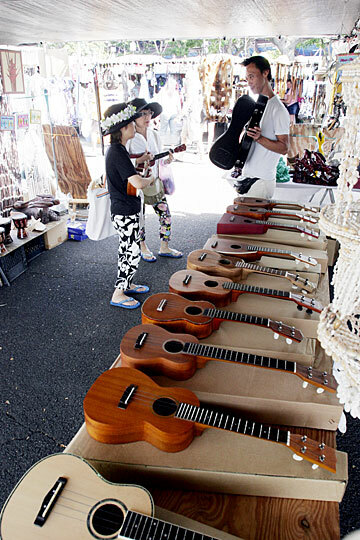 "We don't want to buy from the first vendor that we see," Shinohara said on her way to another ukulele stand. "We want to go around to other stores to find the bottom line for ukulele prices." Maybe they'll buy today, maybe not, the akamai shoppers say with a shrug and a grin. Whether they find something to buy doesn't matter to Shinohara and Imachi or most of the other Japanese tourists who venture to the swap meet, because to them the trip is mostly about the quest for adventure. Going to the swap meet is more about taking in the sights and sounds of local-style Hawaii than it is about shopping, they said. It's also a chance to let loose and get into the spirit of bargaining, an entertaining and satisfying pastime seldom experienced in their homeland. While the more adventuresome Japanese tourists have long been finding their way to the swap meet by bus or car, the challenge of venturing outside of Waikiki has prevented some from enjoying the experience. Starting in April, JTB, one of the largest Japanese package-tour operators to Hawaii, will make the Aloha Stadium Swap Meet a tour stop. For JTB it's a good business decision because it adds a new element to the company's optional tour program, said Sam Shenkus, marketing consultant for Centerplate, the swap meet operator. For the swap meet, it's a chance to follow the lead of Hawaii's visitor industry in diversifying its base market, which is largely made up of kamaaina and mainland visitors, she said. "For JTB to be adding the swap meet as an activity and attraction shows you how diverse the market has gotten. Because Hawaii is considered a mature destination, we need to offer every possible shopping experience to keep the customer interested," Shenkus said. BACK IN THE 1980S, the first Chanel boutique in the United States opened on Kalakaua Avenue because of the strength of the Japanese market, which brought with it a huge expansion of luxury retail in the state, Shenkus said. But times have changed, she said. The quintessential office lady who visited Waikiki in the 1980s to spend her disposable income on designer goods has grown up. She's still visiting Waikiki, but these days, she's got her husband and kids in tow. "The swap meet is now considered to be an alternative shopping choice for the market that drove Chanel, so there's been a lot of change -- it's not good or bad, just different," Shenkus said. Reiko Imachi, left, from Kobe, Japan, and Tammy Shinohara, from Kamakura, Japan, discuss ukuleles for sale with Brian Chua, who owns the Finale tent at the swap meet at Aloha Stadium. 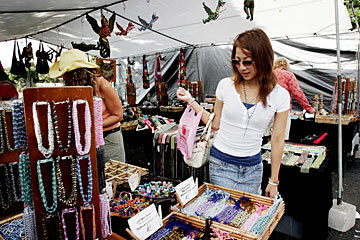 Getting tourists, especially Japanese, to come to the swap meet and purchase items is about offering the right mix of merchandise and making the experience convenient and worthwhile, said Jeffrey Bareng, operations manager for Spartanburg, S.C.-based Centerplate, which took over running the swap meet in 2004. Since Centerplate took over, diversification has been the name of the game, Bareng said. The proliferation of big-box retailers in Hawaii has made it more difficult for small retailers to survive without carving out niche markets, he said. "WE HAVE TO campaign to let everyone know that we have the best deals," Bareng said. "The big-box retailers have set up shop, and now the swap meet isn't the only center in town with discount prices." For visitors, especially Japanese, the true allure of the swap meet isn't so much about shopping as it is about the opportunity to experience a local-resident atmosphere, said Dave Erdman, president of PacRim Marketing. "It's more about the atmosphere, or the 'funiki,' than the shopping," Erdman said. "Yes, they will find some bargains of small items, some omiyage, and some T-shirts. But most surely don't need any major housewares or garage sale-type items." WHEN JAPANESE visitors shop at the swap meet, it's no different from the Americans who travel to Japan and go to Ueno to visit Ameyoko, for some "crazy, crowded street shopping atmosphere with people yelling and bargaining," he said. "We might buy some Japanese snacks, but we surely don't pick up a fresh squid, or crab to take home," Erdman said. "So, it's about the atmosphere and some simple purchases." Indeed, while shopping is as popular with Japanese tourists as ever, the changing demographics of the Japan travel market, somewhat unfavorable yen rates, and increased travel experience have made Japanese shoppers more cautious, said Yoko Odo, a spokeswoman for JTB. "The consumer is getting wiser and seeks price with value," Odo said. "Shopping for the high-end brand is still positive, but on the other hand, wise consumers are looking for items of reasonable price with value, including items related to health." Chua, who operates a wood-items store at the swap meet as well as at the Waikiki Marriott and the International Marketplace, said he's seen the phenomena Odo described in action. "When the Japanese come to the swap meet, they really bargain," Odo said. "However, when they go to the Louis Vuitton shop and the item costs $500, they say they'll take two. The spending power is there, but it depends on the area." AI FUJIWARA OF TOKYO is the perfect example to support Chua's comments. Fujiwara was shopping at the swap meet on Wednesday, but it was for an Aloha print suitcase so that she could carry home all the higher-end stuff that she bought in Waikiki. "I bought so much, I needed an extra bag," Fujiwara said. She found out about the swap meet from a local friend. Fujiwara thinks most Japanese tourists don't know about the swap meet. Unless they know someone from Hawaii, most Japanese who come to the swap meet have to take the bus or limo to get there, she said. "It's fun," Fujiwara said. "If it's on a tour, I think they will come." As Hawaii's visitor industry moves into 2007, shopping will continue to be very important to the Japanese market and there will be more competition for their interest, Erdman said. THE REDEVELOPMENT and repositioning of the Waikiki Beach Walk, Royal Hawaiian Shopping Center, as well as other new venues being developed in Waikiki, plus the new retail and dining venues and Ala Moana and Ward all the way to Chinatown, will garner more interest in Hawaii from the Japan market. "The reinvestment in our infrastructure in shopping is an important and powerful message to the Japanese travel industry and consumer," Erdman said. The beach is going to have big competition from these new shopping and dining venues from Waikiki to Chinatown, he said. "The Japanese will love it, and hopefully will plan to spend more time here in Hawaii," Erdman said. But Waikiki is not the only venue to reposition. 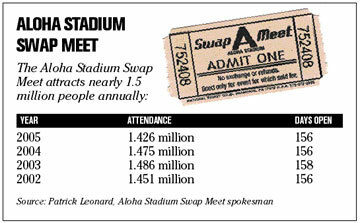 Investment in the form of advertising dollars and event planning is also taking place at the Aloha Stadium Swap Meet, Bareng said. Dara Macklin and her husband, Royce, look over items at a booth. Hawaii's visitor market is about 60 percent repeat, so offering new products and events is important to keeping swap-meet shoppers happy, he said. "Most swap-meet tourists are like part-time locals who have been here plenty of times before," Bareng said. "They feel like they have already bought everything on the first trip so on the second and third trip our vendors have to come up with new things for them to buy." REVENUES FROM RENT hikes at the swap meet have been used to recruit new customers and vendors, increase advertising and bring new events to the center, he said. "We can advertise all we want, but if the vendors don't offer things that the visitors want, then they won't come," Bareng said. These days bargain hunters will find a lot more than the ubiquitous Hawaii T-shirts and aloha shirts at the swap meet, he said. Vendors like Albert Eugenio of Hula Motion, who is trying to launch a new surf brand, and John Parker with his customized photo-framing business have added a new one-of-a-kind dimension to the swap meet, Bareng said. "I wanted to offer shoppers something more," said Eugenio, who hopes his original brand will one day compete with the likes of Quiksilver and Billabong. The swap meet once had a reputation of offering a tired product mix, but those days are gone, said Parker, who moved to Hawaii two years ago from Portland, Ore., to open his photo-memory shop at the swap meet. "Customers from all over the world visit my shop because I offer a unique product that appeals to all groups," Parker said. On Wednesday, a Canadian tourist bought all of Parker's Aloha photo mats. Once the Japan market gets cranking, Parker said he hopes he'll find the same demand.